Well, the 2012 Crufts Dog Show is on in Birmingham, England. And things are a bit different in the UK dog show circuit. 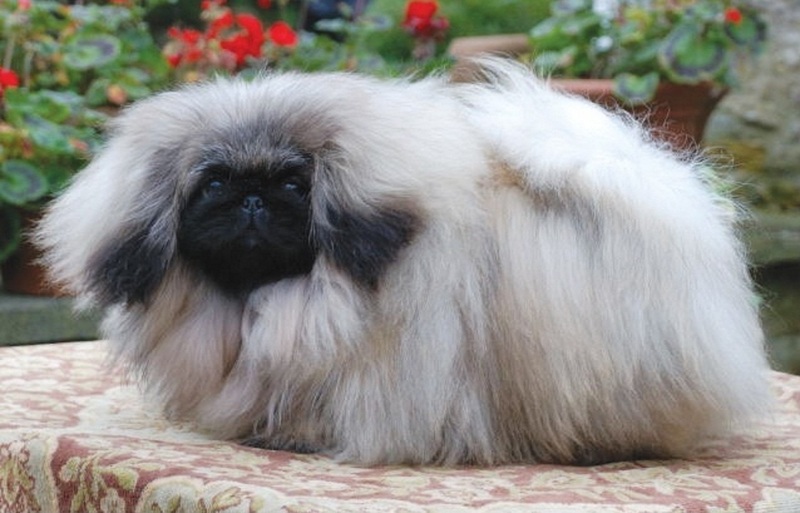 This year’s Westminster Kennel Club Dog Show awarded a Pekingese named Palacegarden Malachy Best in Show. As I noted at the time of the win, this was a win for qualzucht-– “torture breeding”– and will do nothing more than fuel the flames of the animal rights extremist lobby.Continued denial of this dog’s obvious conformation issues and then celebration of his victory at this show are nothing more than accelerants to that fire, which is burning hotter and hotter every year. Palacegarden is the an Pekingese kennel that is operated in Northumberland in the far north of England. It is owned by Jim and Jean Smith. And they have done reasonably well on the UK show circuit. I don’t believe this particular site is up to date, for there is no mention of Malachy, a grandson of their dogs Palacegareden Sullivan and Palacegarden Donovan, in their “brags” section. But the Smiths are his breeders. He was born in the UK, but he is being campaigned in the United States. They are also breeders of Palacegarden Bianca, and she is being campaigned in the UK. She was also shown at Crufts this year, where she was expected to do quite well. She would have won Best of Breed at Crufts. She failed a health test. As a result of the pressures coming from Jemima Harrison’s Pedigree Dogs Exposed documentary, the Kennel Club (of the United Kingdom) decided to implement health checks for all Best of Breed winners in 15 breeds at all of its General and Group Championship shows this year. These health checks are given by independent veterinarians, and if they say the dog isn’t a healthy example, it is dismissed. The KC won’t list the reason why both the bulldog and Peke were denied BOB’s this year, but both breeds are severely brachycephalic and are well-known sufferers of brachycephalic airway syndrome, which interferes with a dog’s ability to fully respirate and cool itself. This condition is directly connected to breeding for the very short muzzle in both of these breeds, but this short muzzle is seen as ideal in the both breeds’ official breed standards. Because they can’t have a BOB, the Peke and bulldog cannot compete for the group or Best in Show, and the point is to force breeders and judges within these breeds to produce and put up healthier animals. With the Peke and bulldog, they will probably either have to change the standards or their interpretation of the standards. And their fanciers will complain. I seriously doubt that Malachy could have passed the test either, seeing as they were both bred by the same breeders and to the same standard. He may have, but his lumbering gait and hard panting, clearly showed to me that he wasn’t a good example of what a dog should be. Of course, we won’t know for sure. However, because the Kennel Club has been forced implement health inspections for dogs in certain breeds before they can become BOB, dogs with welfare issues associated with their conformation cannot advance. 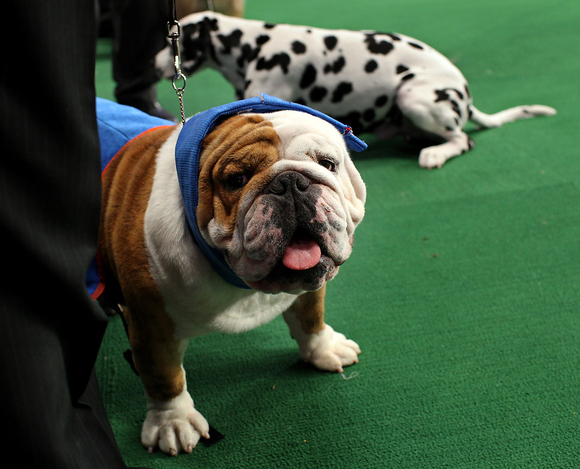 In the American Kennel Club, no such requirement exists at conformation shows. And this is why we see dogs like Malachy winning major shows– and everyone oos and ahs over him. In the United Kingdom, this is no longer acceptable. And I think we should thank Jemima Harrison and her production company for putting the pressure on the Kennel Club to implement these reforms. Pedigree Dogs Exposed really opened the eyes of so many people, and it dragged the somewhat recalcitrant British dog fancy into making some modest changes for the health and welfare of purebred dogs. But in America, where PDE has had very little exposure, people still think it’s okay. The dog and its breeders get lauded. And the dogs continue to suffer from their partially blocked airways. PDE specifically targeted the pekingese for its extreme conformation, detailing how Pekingese named Danny actually won BIS at Crufts in 2003. The rumor mill suggested that this dog had had a facelife. When Jemima Harrison’s team tracked down the real story, it turned out that he had not had a facelift, but instead, he had undergone a procedure to pare back some of his soft palate, which was obstructing his trachea. Dogs with extremely short muzzles have mouths and throats like normal dogs, but they don’t have enough space for all the things that go in there. It is possible for the soft palate to become very scrunched up in the back, which restricts the airways. Facelifts for show dogs are illegal under Kennel Club rules, but soft palate surgery is not. Perhaps most infamously, Danny had to be placed upon an icepack to cool himself just before the awards ceremony at Crufts. I was waiting for Malachy to be placed on an icepack. I think he needed it that night, but my guess is his handlers were smart enough not to do that while the cameras were running. So here we can see a real world example of how Pedigree Dogs Exposed has changed the conversation. In America, an extremely brachycephalic Peke wins Best in Show at the American Kennel Club’s most prestigious show, but in the UK, a Peke from the same kennel is dismissed because she doesn’t pass a health inspection. It’s a real shame that PDE never received the exposure that it deserved in the United States. This is the land of Citizens United, plastic surgery, and Hollywood. Glitz, glamour, and fakery of all sorts comprise much of the national zeitgeist. But if things start to change for the better in the UK, it might start to trickle in over here. And Chris has a post up at BorderWars on this same subject. Update: It turns out that Crufts did allow another bulldog to be shown in the Utility group, so a member of the breed can be judged in group following this dismissal. Still wonderful news! Keep up the pressure. Things will move here. Maybe PDE will go viral is we all give links for it. The problem is Americans are just not interested in television with foreign accents. For freakin` sakes, BBC documentaries are dubbed over here on National Geographic and Discovery because they are afraid the common-folks cannot understand the educated accent. YouTube made everything worse by having so much content on it, things get lost in the immersion of it all. Ontop of that, you always get the attitude of “it is someone else`s problem” regarding non-domestic issues. When i was a kid, I loved the Survival Anglia films. They were always narrated by someone using speaking using Received Pronunciation. Even now, I have an easier time understanding British accents, even if they aren’t proper uppercrust accents than some of the Southern Accents in the United States. Like the BBC Life documentary where Sir David Attenborough narriated, yet America had to enlist Oprah Winfrey to dub over it… Sad. Oprah Winfrey? I thought the actress who played Ellen Ripley in Aliens did the narration for it. How many times did they dub the thing?! I was confused. Planet Earth is Sigourney Weaver. Life is Oprah. Ah that would make sense then. I haven’t seen Planet Earth. Is THAT why I don’t get my documentaries narrated by Sir David Attenborough, who is loved so much in my house that everyone drops everything when one of his documentaries is on? Is that really the reason? I love how these most coveted of conformation dogs have bodies with the least amount of discernible structure. They have molded their heads into little spheres with as little deviation from a ball as possible and the body is completely indistinct from a rounded brick. I imagine that if you shaved them, they’d have a compact and stubby shape under all that hair too. I don’t understand the appeal of having a dog with so much hair that you can’t actually see the dog. Was watching the Westminster Circus. There was a smooth collie with a tiny head. Then a regular neck for 1/2 its length. Then the neck widened out – I can’t describe it. With hair it would have been a rough collie. Made me wonder what is going on under the hair of all the other hairy breeds. The answer: Using hair to hide poor conformation from judges who can’t tell what proper conformation is just through feeling it through the fur. Thanks for the confirmation. I thought they were supposed to be able to feel it through fur. To some extent, you can. I’ve had my hands on Samoyeds, and you have to dig through the fur, but you can feel the shoulder blade, the hip bones, elbows, etc. And with any dog you really need to get your hands on them to evaluate structure, a couple of pictures don’t tell the whole story and a single picture can show a very different dog, for better or worse. If you want conformation judging, most judges do not study the dogs with their hands as thoroughly as they should. It would take too long. Watch the toy judging, often they don’t dig through the hair at all. They stroke it down, but that’s no good at all. Digging through to feel the structure would mess up the coat, and they judge that more than the dog underneath anyway. As an owner of coated dogs, even after sixteen years with them, I can tell you that you need to be thorough indeed to feel the dog through the coat, accurately. There should be a shaved dog class. For a full championship, coated dogs must win three firsts in the shaved dog class after earning a regular championship. Or something like that. I say go for it & I for 1 would take on raising awareness to gain funding & any other jobs that i could help with from afar. I try to talk PDE up as much as I can, but I’m mostly preaching to the choir with my social circle. the AKC people are all Brit wannabees. They love it. I have been trown off most social mediums that I feel it would be worthwhile force feeding this infomation too as they don’t like to be openly challenged at the best of times but when you start backing up your claims of breeding unsound dogs on purpose with proven research & data they feel they must silence you at all costs it seems. But if we pooled our resouces, knowledge, contacts, money & actively looked for further funding & information surely we could make a docco the American public could relate to. I want to show aussies that we should not be following any other countries lead on these things too & it’s time we started standing on our own morals & guide lines & the best way i can see to do that is by showing them how wrong both america & Brittan are/where on the welfare of their dogs breed for the show ring. those 2 countries are where aussies tend to look to & blindly follow when it comes to many areas to do with dog showing & breeding. I never thought I would see aussies wanting to super size their big breeds & make the toys even smaller as many Amrican kennels have but I’m afraid it has caught on here also.Many websites of so called ethical & rspondsible show breeders have comments like we breed the true sized big TM’s(for example only) & similar for the toy breeds. Here is something that’s worth celebrating, let’s hope its a trend! Pekingese’s are wonderful dogs! Most breeders are very concerned for their welfare and do not try to breed dogs which will have obvious health problems. I know a breeder very well and her dogs come first in all aspects of her life. I think we need to remember that we do not know why the dogs failed the vet inspection, it may have nothing to do with the issues highlighted above, you’re are taking ill informed guesses. I have a pekingese, she is very fit and I take her for long walks with my Springer. After the walks they’re both panting, both hot and both very tired! In the summer I clip my pekingese’s coat, as it is quite thick. But also in the summer I wear my hair up as I get too hot with it down! How polite retrieverman! you are obviously a very ignorant, ill informed individual who likes to preach their rubbish without any facts. You obviously don’t like anyone to disagree with you, what a pompous individual, just goes to prove how closed minded you are!